German composer, pianist, and physicist; born Oct. 8, 1845, at Thorn, West Prussia. He studied at the Jewish Theological Seminary of Breslau and the universities of Breslau and Berlin (Ph. D. 1868, his dissertation being "De Aristotelis Rhetoricis et Ethicis Nicomachæis et in Quo et Cur Inter Se quum Congruant tum Differant," awarded a prize by the philosophical faculty of the University of Berlin). After acting as tutor for a year at Amsterdam he returned to Berlin to study physics and chemistry. In 1876 he established himself as privat-docent at the Bauakademie of Berlin, subsequently connecting himself in the same capacity with the Technische Hochschule at Charlottenburg, at which institution he was appointed lecturer (1894) and professor (1896) of physics. He has edited Goethe's scientific works, with notes and introduction (ed. G. Hempel, vols. xxxiii.-xxxvi., 1877-79); translated Faraday's "Experimental Researches in Electricity" into German (3 vols. 1889-91); and has published many essays on physics, chemistry, and electricity in scientific periodicals. 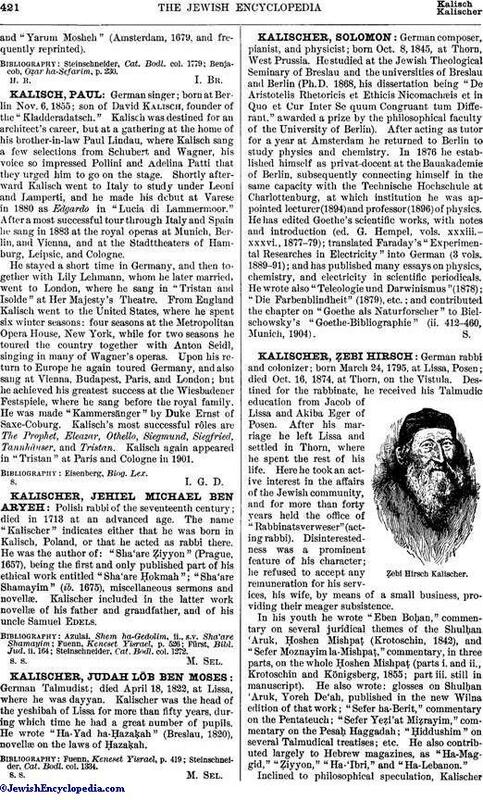 He wrote also "Teleologie und Darwinismus" (1878); "Die Farbenblindheit" (1879), etc. ; and contributed the chapter on "Goethe als Naturforscher" to Bielschowsky's "Goethe-Bibliographie" (ii. 412-460, Munich, 1904).